Japanese nuclear regulators discovered a fresh leak of radioactive material Thursday from an atomic energy plant damaged in an earthquake this week, a report said, adding to criticism of the embattled plant operator. Kyodo News agency said officials from the Nuclear and Industrial Safety Agency found radioactive iodine had leaked from an exhaust pipe at the plant. Operator Tokyo Electric Power Co. had already announced the release of other radioactive materials from the exhaust vent previously. The inspectors concluded the leak was too small to harm the environment or public health, Kyodo reported. Officials at the agency said they could not immediately confirm the report. Members of a separate panel, the Nuclear Safety Commission, also toured the plant on Thursday and regaled TEPCO for missteps in its response to Monday's quake, which killed at least 10 people and injured more than 1,000 others. Still, the commission concluded none of the errors threatened public health. "The safety of ... (the) plant was fundamentally maintained and we avoided the serious consequences of a nuclear accident," Commission Chairman Atsuyuki Suzuki said in a statement. "The list of problems announced by TEPCO have no serious effect on the safety of the reactor." Commission members criticized TEPCO for a bungled response to a quake-triggered fire at an electrical transformer. Plant officials said they had no chemical fire vehicle at the plant, and local fire officials took 90 minutes to respond to their call. The commission also said the fuel rods in the plant were stable, but that the inside of the reactors should be checked more thoroughly. Chief Cabinet Secretary Yasuhisa Shiozaki on Thursday urged the operators of Japan's 55 nuclear reactors to speed up safety checks for earthquake-resistance, a top concern in this temblor-prone nation. "Since there was such a huge earthquake that surpassed our expectations, we need to consider future measures for quake resistance," Shiozaki said. "I asked them to speed up the assessment and check ups wherever possible." The plant fire, which blazed for two hours, likely broke out after the quake caused the ground beneath an electric transformer to sink, damaging cables, causing a short circuit and igniting leaked insulation oil, the business daily Nikkei reported, citing a probe by the prefectural government. The quake has caused trouble for other industries as well. Toyota, Nissan, Honda, Mitsubishi and Fuji Heavy Industries, the maker of Subaru, all halted production because a key parts supplier was damaged by the temblor. Fears of an electricity shortage in the nation's capital swelled when the plant was shuttered. Operator Tokyo Electric Power Co., Japan's largest utility, was scrambling to ramp up conventional power output. In the damage zone, residents struggled to put their lives back together, though basic services such as water had not been restored to some areas. "Until we get gas and water, we can't think about the future. For now, we're just getting by day by day," said Masatoshi Ogawa, sitting in front of his closed pachinko parlor. "Our houses were OK so we didn't have to go to evacuation centers, but life without water is really inconvenient." 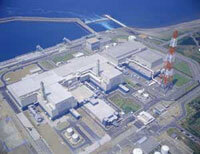 TEPCO has warned that the closure of the key nuclear reactor could trigger a power shortage in the summer months. The Tokyo-based company has asked six other power companies in Japan to consider providing emergency electricity to prepare for a surge in demand as people turn up their air conditioners in the summer heat. Though Japan is one of the world's most earthquake-prone countries, officials at the plant admitted that they had not foreseen such a powerful temblor hitting the facility. TEPCO has had problems like this before. In 2003, TEPCO was forced to halt all of its 17 nuclear reactors after admitting it had misreported safety problems in the late 1980s and early 1990s. A trade ministry report revealed 29 cases of cracks or minor structural damage in eight of the company's nuclear reactors, including two reactors at Kashiwazaki-Kariwa. The company's top three officials resigned over the scandal, and authorities raided its Tokyo headquarters. TEPCO contended the cracks never posed any serious danger. The last of TEPCO's shuttered reactors was cleared to reopen only in July 2005.